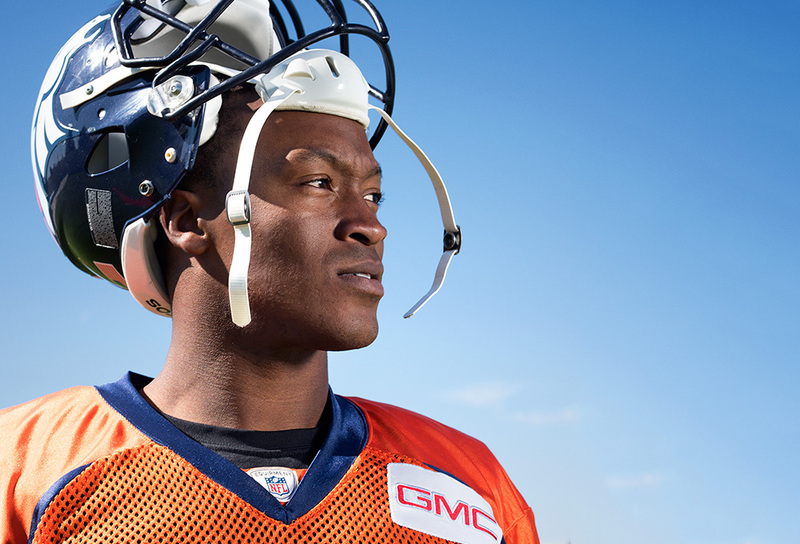 Demaryius Thomas is within reach of realizing all his NFL dreams. But to gain what he wants most -- his family reunited -- he's learning to let go of what tore them apart. HE AWOKE TO the blast of the front door flying off its hinges, and Demaryius Thomas peeked out his bedroom window and saw six unmarked cars and a dozen police officers with their guns drawn. A pack of drug dogs roamed the front yard. The spotlight from a police cruiser cut through the predawn darkness of rural Montrose, Georgia, and shined into his single-story house. "Don't move!" Thomas remembers hearing one of the officers yell, so he ducked back into bed and hid under the sheets. He was 11 years old on that March morning in 1999, but he already knew enough to understand what these policemen had come looking for. He already knew they would find it. An officer in black tactical gear entered his room without knocking, pulled him from bed and led him to the kitchen table, where the rest of his family was already waiting. During the many lonely milestones still to come in Thomas' life -- at the NFL draft, the Pro Bowl, the Super Bowl -- he would think back to this moment and remember it as the last time his family sat together: his stepfather, cursing, blood running down his face from a cut suffered during the chaos of the raid; his 3-year-old sister, hysterically crying; his 9-year-old sister, shivering in her pajamas; and his mother, Katina Smith, seated in her chair, praying and sobbing and swearing that she had done nothing wrong. They sat at the table for an hour as the police officers searched through their house. The dogs paced across the backyard where Thomas had just started learning to play football. Officers inspected his basketball uniforms and his trophies and tore open the cases of his video games. Finally their search led them to a closet in the master bedroom, where they found a purple coat with hot-pink lining. Inside one pocket were two gigantic rolls of cash: 30 $100 bills and more than 60 $20 bills, totaling more than $5,000. "It's just my tax refund," Smith said, but her son and the agents knew better. The officers placed Smith under arrest just as the school bus turned up the dirt driveway toward the house. Thomas begged to stay home from his junior high school -- to go hide again in his bedroom -- but his mother wouldn't let him. Instead, she asked the officers for a favor: Could she walk her son to the school bus, like she did every morning? "Please, you don't have to do that," Thomas said, trying to dissuade her, but by then he was already being led down the driveway. His mother walked next to him, her hands cuffed behind her back, as six officers trailed behind. Years later, as a wide receiver for the Denver Broncos, Thomas would consent to a routine appointment with a professional sports psychologist who wanted to talk about defining moments. What were the memories he drew on when the pressure became suffocating? Was it catching Peyton Manning's first touchdown pass as a Bronco? Scoring a game-winning touchdown in the 2012 playoffs? "I don't really think about any of those things," Thomas remembers telling the psychologist. He instead told the story of March 15, 1999: The door kicked down. The drug dogs everywhere. His mother in handcuffs. And now the school bus waiting in the driveway for a shy sixth-grader in Montrose, population 154, where it suddenly seemed as if everyone were watching his life come apart. That was fear. That was pressure. That was the defining moment. "The worst bus ride of anyone's life," Thomas said. He tried not to cry that morning as his mother walked him to the door of the bus. She told him she loved him, and he waved to her as the bus rolled away. The other children fixed their eyes on him. They cleared their legs from the aisle to make room for him to pass. He walked to a seat near the back and sank into the green vinyl. The bus was silent. The two-mile ride stretched on forever. When they pulled up to school, Thomas was the first student to speak. "Don't any of you dare say nothing," he said. 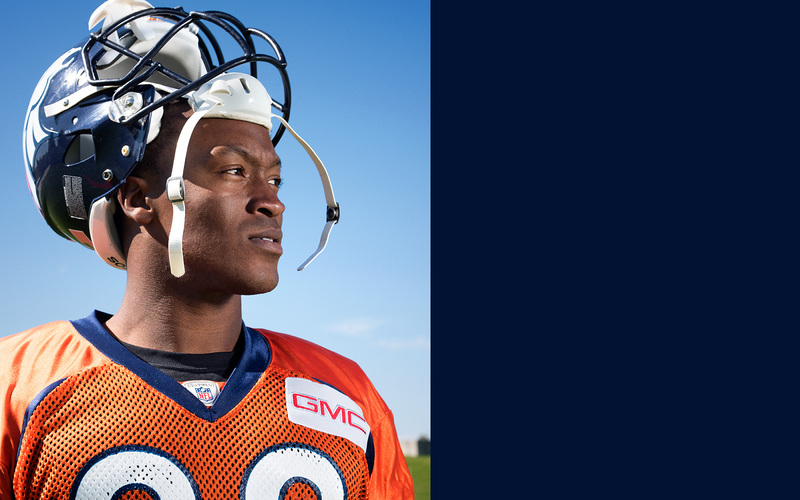 In a feature that originally aired in the fall of 2013, "E:60" tells the poignant story of Broncos wide receiver Demaryius Thomas, whose mother and grandmother cheer for him from behind a prison wall. BAY-BAY, OR Mama's Boy, is what his classmates had called him up until that day, and those nicknames didn't bother him because they were true. Smith was only 16 when her son was born, and by then Thomas' father was already away at basic military training and then off to Saudi Arabia. Smith dropped out of high school, and for the first several years she shared a bed with her son in a single-wide trailer near Montrose. They lived out in the vast nothingness of central Georgia, in a field of pines located 40 minutes from the nearest grocery store, in Macon. They had no car and had to rely on rides from family members. There were no neighbors. They stayed together in the trailer and played. "For as long back as I can remember, she was pretty much the only person I felt like I knew," Thomas says. "Nobody was closer to their mom than me." Their biggest problem was money: They never had it, and sometimes Smith fell behind on the gas bill or rent and had to borrow from relatives who were also in debt. She turned 18 and got a job pressing the tags onto shirts at a fabric factory -- 50 shirts coming down the line each hour, 400 shirts each day. She broke off the relationship with Thomas' father and married a co-worker, and they moved farther out into the woods, into a double-wide on two acres. They had two daughters, but Smith continued to spend most of her time with Thomas because he made all of her interests into his own. Mini-me, she called him. She liked to run, so he sprinted with her down the gravel road. She liked music, so he taught himself to play tuba. She liked to drive, so she taught him to drive too, even though he was only 11. They would race each other in the open field behind the house -- she'd drive the stick shift in an old Bronco and he'd drive the Accord. She never once let him win. "You have to earn it," she said, and so he turned into a competitor to please her. He signed up for a basketball team, and she used the machines at the fabric factory to iron his number onto one of her T-shirts. She wore it to games and paid him $5 for every 3-pointer he made. Whenever his mother was away -- working late at the factory or visiting friends for the weekend -- Thomas went to his grandmother's home, a beige single-wide five miles down the road. Minnie Pearl was the family matriarch, the best cook, and she hosted Sunday dinners and demanded everyone attend church. She considered herself a provider, and she tried to lend her children money and give her grandchildren a weekly allowance, but instead she was usually broke, stuck in the trailer with a car she couldn't afford to fix. She had two adult children of her own still living with her in the trailer, including a son with mental disabilities, so when Thomas stayed over he slept on a couch in the living room. He could see everything from there. He noticed strangers coming and going. It confused him. After some nights, he went home to his mother's house and greeted her with a wave of questions. What was that stuff always cooking in the kitchen at his grandmother's, white chunks in a pot that smelled of burning plastic? Who were all those people coming and going from the trailer, a dozen or more each day -- "visitors," his grandmother called them, even though they came with crumpled twenties and never stayed for more than a few minutes? Why was his grandmother sometimes leaving the house in the early hours, driving off at 3 in the morning? And why did he sometimes hear his mother's voice too out there in the dark in the middle of the night, talking about money? One day, when he was 9, he came home from one of those visits and sought out his mother. "I think something bad is happening," he remembers telling her. "Mind your own business," she told him. "You're probably dreaming. It's nothing." But his mother started increasing her hours at work, and Thomas started spending more time at his grandmother's trailer, and before long he was old enough to see for himself and begin solving the mysteries. That was crack cocaine cooking on the stove. Those were scales used to measure it. These were drug users who kept coming into the trailer and then disappearing into the abandoned red gas station next door, emerging a few minutes later with glassy eyes and thousand-yard stares. That was his mother coming and going with her pockets full of money, giving it to Pearl or taking it from her, acting like the bank. And that was the cash from a drug operation sometimes lying around his mother's house because she was helping hide the profits. Soon more customers were coming to Pearl's house, and the business was growing, and suddenly his grandmother's hair was always done up like she was ready for a wedding. Instead of eating Sunday dinners at the trailer, they now all drove 50 miles to Ryan's restaurant in Macon, where Thomas no longer had to order off the children's menu and where for the first time since he could remember no one in his family worried about the bill. In the winter of 1998-99, Thomas approached his mother again, more insistent this time. "Grandma is dealing drugs, and you're helping her," he said. "Something bad is going to happen. They're going to take you away." "It's fine," she told him. "I'm not doing anything. Stop worrying." "I don't believe you," he said, and a few months later he awoke to the raid. RIGHT AWAY, THE prosecutors offered Smith a plea bargain, and her lawyer told her to take it. "This is a no-brainer," Smith remembers her lawyer, Elizabeth Lane, telling her. Lane explained that if Smith took the plea and admitted to her role in the drug ring, she would get only four years in prison. But if she didn't take it and was found guilty of conspiring to distribute drugs, she'd get at minimum a 20-year sentence. The only stipulation of the plea, Smith remembers, was that she would need to testify against her mother, Minnie Pearl, whom prosecutors called the "hub" of the operation, who had two prior drug offenses on her record and whom everyone else was already testifying against anyway. Pearl's cousin had taken the plea. Pearl's live-in boyfriend, a reverend, and a drug runner, had taken the plea. Her distributor, her lookout man and her handyman had all taken deals too. Now all that was left was one more plea deal, for the daughter who had become Pearl's accountant and banker. "Just do it. Say what you gotta say against me and move on," Minnie Pearl told her daughter. "There's no point in both of us going away forever. That's just being stubborn and stupid." "No way," Smith said. "I can't testify against you." "Don't throw your life away," Minnie Pearl said. "You can still see your children grow up. 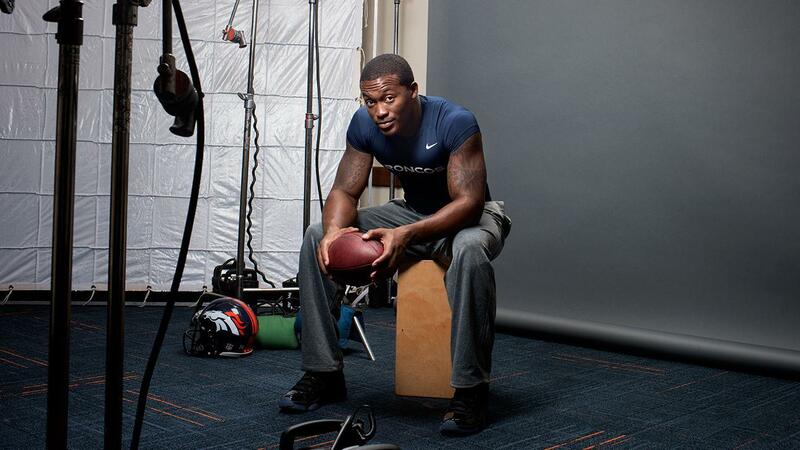 You might be home before Demaryius is even in high school." "No," Smith said. "How could I turn on you?" Smith had always felt as close to her own mother as Thomas felt to her. Minnie Pearl had raised her children alone, after her husband gambled away the family's money and left them stranded with no savings in a mobile home in central Georgia. Pearl had worked two jobs. She had taken the midnight shift. She had started dealing drugs, she says, mostly because she wanted to better provide. "You did this with family in mind," Smith told Pearl. "So what kind of backstabber does that make me if I can't stand by you?" "It hurt so much to see him that I actually ached." So together Smith and Pearl took the case to a joint jury trial, and for three days Thomas and his sisters skipped school and dressed up for court. They sat in the gallery and listened, Thomas holding his youngest sister in his lap. Smith's lawyer spoke first: "For the record, my client is proceeding to trial over my objections and against my advice," she told the judge, and from that low point somehow things got worse for Smith and Pearl as prosecutors detailed a drug ring that operated from 1992 to 1999. Pearl had started out dealing weed to make extra money when she fell behind on her house payment, but she switched to crack cocaine when she realized addicts made the most consistent customers, prosecutors said. She regularly purchased about $1,000 in drugs from a supplier in Florida and then sometimes sold the drugs for twice as much, eventually making enough money that she decided to store some of the cash in the closet of the master bedroom at Smith's house. Smith brought Pearl more money whenever she needed to re-up her drug supply, prosecutors said. Neither Smith nor Pearl was a drug user, but the operation was every bit as desperate and unstable as the customers it depended on. Pearl ordered her shipments for the 1st and the 15th of each month because that was when her customers received government checks and had money to spend. She referred to an ounce of cocaine as a "shirt," and she ordered four or five shirts each month. She hid her drugs in the rafters of an abandoned gas station filled with molding food and field mice. Her bodyguard was also her boyfriend; her junior dealers were addicts who got paid in crack at the beginning of each shift; and her lookout man was a thief who spent most of his time searching the rafters of the gas station, trying to steal her supply. When Minnie Pearl worried about getting caught by police, she sought comfort in religious chants and root doctoring, stringing peppers across the ceiling of her trailer. In her busiest weeks, prosecutors said, Pearl could move $5,000 in drugs, but she still drove a late-'80s Oldsmobile with a bad transmission and ironed pant legs 40 hours each week at a local textile factory. "What did she do with the money?" a prosecutor asked during the trial when Pearl's live-in boyfriend was on the stand. "She took me out to dinner," the boyfriend said. "She bought clothes and got her hair did and made house payments and car payments and paid her bills and provided for the children. She was real free-hearted." The prosecution finally rested its case after three days -- after playing taped phone calls between Pearl and Smith talking about drug money, after showing photos of drugs and cash, after testimony from 14 witnesses. "Now it is the defense's turn to present its case," the judge said, but the defense didn't have a case. Neither Pearl's lawyer nor Smith's lawyer called a single outside witness. The jury left the courtroom to deliberate one day at 3:55 p.m., and Thomas took his sisters outside the courthouse to play. By 5, the verdict was in, and Thomas hurried his sisters back into the courtroom to hear it. "Guilty," the lead juror said, and later the judge clarified the details. Minnie Pearl, 43, would be sentenced to two terms of life in prison. Next the judge addressed Smith, 27, and to Thomas, his mother's sentence almost sounded longer: 294 months. Or more than 24 years. FOR THE FIRST seven or so of those years, Thomas never wanted to visit his mother. But he went along reluctantly during the first months with his stepfather -- who wasn't implicated in the crime -- and his sisters when Smith was initially imprisoned. His mother was always given 15 minutes to talk to them, and they stared at her through a sheet of Plexiglas and took turns talking into a phone. Thomas found it hard to look at her. He knew she was guilty. He knew she had turned down the plea. Each of the children got three minutes, and Thomas always allowed his anger and frustration to build over the course of the visit and then spoke to her last. Three minutes. How could any two people sort through so much misery in so little time? On one side of the glass was Smith, red-eyed, unable to silence her most pressing and painful questions at night, and trying out an antidepressant medication for the first time in her life. If refusing the plea had seemed to her like a noble decision during the trial, it now felt like an insane choice, and the endlessness of each day amplified the realities of a 20-year sentence. "There's no room for high-minded ideals in here," she said. Already Demaryius looked different to her on the other side of the glass -- older, harder, more resentful. How many 3-pointers had she missed already? How many more would there be? At night, when the prison went dark at 11, she lay awake in her bed and asked the same questions. "Do my children think I'm a bad mother? Do they understand?" And now she could look through the glass and see the answer in her son's eyes. "You chose this," he told her during one visit. "You decided to be in there instead of out here with us." Smith tried to console him, but there were only three minutes to account for the biggest decision of her life. "I love you," she would say. Or: "You'll be OK."
But how did she know that? Thomas wondered. At least his grandmother's arrest was something he could process. It was awful, but the fallout was not quite so personal. It was his mother's arrest that had cost him his house, his sisters -- every bit of stability in his life. Demaryius moved every few months in those first years. His sisters went to live with their stepfather's mother, but he never really got along with his stepfather, who divorced Smith after the trial, and Demaryius didn't want to be the only boy in the house. He went to his father's apartment in Atlanta, but his father was always being reassigned by the military, and any new home was far away from his friends. Then he went to a cousin's trailer in Montrose, but that cousin already had five foster children and couldn't take another; and then to his father's mother's house a few miles away, but her health was failing; and then in with a nearby aunt, but she had no car to pick him up from basketball practice. One night, desperate for a ride home after practice, he called a different aunt and uncle to pick him up. James and Shirley Brown took him back to their house outside Montrose, and Thomas never left. The eighth-grader they took in bore little resemblance to the sixth-grader who had raced cars with his mother and played Christmas carols on the tuba. "I was really to myself, not trusting nobody, just angry at the world," Thomas says. He wrote letters to Smith but never sent them. He made friends promise not to mention his mother in any context, and when one of them did, Thomas shoved him off a porch. His mother sent pleading letters to the Browns, asking them to bring her son for a visit, but each time he refused. "It hurt so much sometimes not to see him that I actually ached," Smith says. The Browns' house was a serious place, built on chores and responsibility. James worked as a lineman for Georgia Power, a dangerous job with abundant overtime, and he believed children should work too. Thomas became an usher at their Southern Baptist church. His curfew was 9 p.m. His grades had to be A's. That he became an all-state receiver was fine but not important. On Saturdays, he awoke at 5:30 a.m. to pick two acres of peas in the Georgia heat, filling 25-pound bushels that James rarely bothered to sell. "What's the point of this if we're just throwing these peas out?" Thomas asked one day, and James explained that the point was that picking was Thomas' responsibility, that being an adult would sometimes mean doing things he didn't want to do. "You should go see your mother," James told him, again and again. "It's the right thing to do. She loves you. She needs you." "No," Thomas said, each time he was asked. IT WASN'T UNTIL Thomas arrived at Georgia Tech on a football scholarship that he started thinking more about what it meant to be an adult, and what those responsibilities entailed. He was living alone for the first time in his life, and the loneliness of college made him want to call his mother, who he still believed was the person who knew him best. They started talking once a week, filling the allotted 15 minutes tentatively at first, discussing football and college and the ways in which a dorm room resembled a prison cell. "She was funny, and it made me remember how much I missed her," Thomas says. On the practice field each day, the Georgia Tech coaches made the players repeat the tenets of the football program: family, togetherness, loyalty -- and Thomas turned those concepts over in his head. Maybe it had been his mother's responsibility to remain loyal to Pearl, no matter what she had done. And maybe now it was his responsibility to remain loyal to his mother, no matter what choices she had made. He began talking to her more regularly, once or twice each week, his ease with her growing. Then in October of Thomas' junior year, Georgia Tech played a road game against Florida State in a stadium five miles from the federal prison in Tallahassee where Smith was serving out the remainder of her sentence. Thomas caught two passes for 84 yards and a touchdown. Afterward, he stayed behind to visit his mother. It had been at least five years since Thomas had seen her, he says, and that had been for an angry three minutes through Plexiglas. His father, Bobby Thomas, had traveled to the Florida State game, and he drove his son to the prison, a redbrick building surrounded by barbed wire. "I've never seen him that scared, going in there to see her, not knowing what to expect," Bobby says. A guard patted Thomas down and took him into a sterilized cafeteria, where the chairs and tables were nailed to the floor. His mother was there waiting: still thin, still fit, and jumping up from the table to greet him. "My baby," she called him. "I'm grown," he remembers telling her, and for the few minutes their conversation was awkward. He still wanted a full explanation for what she had done. He wanted her to apologize, and this time they had more than three minutes to fill. "We have to start again from the beginning," Thomas said, finally, so his mother began by telling him the full story of her arrest. She explained the details of the plea bargain. She told him about the sleeplessness and the depression, and she told him that his sixth-grade picture was pinned above her bunk bed. "I miss you every day," she said. She told him she loved him. She told him she was sorry. "Would you make the same choice again?" Thomas asked her. "I don't want to lie to you," she said, and so she said that yes, she would. She told him about her own definition of loyalty and how she felt she owed her mother for the ways she had provided for her. "It was no win either way, and I had to live with myself and the choice that I made," she said. "OK. Let's try to move past it," Thomas said, because even if the answer didn't satisfy him, at least now he understood. His mother had acted out of responsibility, out of love, and now it was his turn to do the same. He didn't have to entirely forgive her choice, but he felt it was his responsibility as a son to forgive her. They played card games for a few hours. They talked about cars and girls and football until the visitation time ended. Thomas said goodbye and reached out to hold Smith's hand. It was a small gesture, but it was also the only physical contact the prison allowed. "I love you," he said. SMITH AND PEARL, now in the same Tallahassee prison, watched Demaryius' career unfold in the plastic chairs of the facility's recreational room, on an old block television bolted to the ceiling. Loud talking and excessive noise is prohibited, read a sign on the rec room wall, which made cheering particularly hard. There was Thomas, averaging more than 25 yards per reception during his junior year at Georgia Tech. There he was again on the screen at the 2010 NFL draft, the No. 22 pick, wearing a light blue tie just like Smith had suggested the night before during their phone call. There he was racing down the sideline to score the overtime touchdown against the Steelers early in 2012, with Smith screaming so loudly in the rec room -- "Nobody is catching him! Nobody!" -- that guards came in to quiet her down. Thomas had more than 1,400 yards receiving in both 2012 and 2013, and soon his reputation had reached the wider prison population. The rec room became crowded during games. The guards turned into Broncos fans. Thomas sent a package of T-shirts, and his mother got special dispensation to wear one so she could once again dress in her son's number while watching him play. She rolled newspapers into pompoms and wrote messages in colored pencil on her face. "Superstar momma," one read. But in other ways, Thomas' accelerating fame made the distance between her life and his seem bigger. She called him in February on the night before he played in the Super Bowl because it had become their tradition to pray together the evening before games. Thomas was alone in his hotel room, and he told her he was looking out over New York City, where some of the buildings were alight in the Broncos' and Seahawks' colors. "I can't even imagine what that's like," she remembers telling him. "What are you looking at right now?" he asked. "The sink, the toilet and the concrete wall," she said. "It's always the same." Lights on at 6 a.m. Off to work at the prison commissary beginning at 6:30. Two miles on the rec yard track each afternoon. Shower. Dinner at 5. For the past several years, Smith has been sharing a room with her mother in the low-security wing of the prison. Minnie Pearl sleeps on the bottom bunk, and Smith stays on top. They mostly live together in comfortable silence, having recycled through most of their doubts and regrets during conversations in those first several years. They have two lockers, a sink, a toilet, a table and a door -- a privilege earned by two years of perfect behavior. On the inside of that door are pictures of Thomas and Manning in their uniforms, Nos. 88 and 18. There is rarely free time in the schedule for improvisation or time to think, which Smith considers mostly a relief. She signed up to teach an exercise class, play on a volleyball team and lead a Bible study to fill whatever free time she has. It is in the quiet moments that the sleeplessness and the depression still sometimes leak in. "If I start thinking," she says, "then the only thing on my mind is everything that I'm missing with him." THIS IS HIS contract year, his chance to set up the future, and maybe this is also how the pieces of an 11-year-old boy's life fall back into place. If somehow he can continue to play well ... and if he can break a few more records ... and if the Broncos can win the Super Bowl ... and if he can sign a long-term deal for $12 million a year ... then maybe he can restore some stability to the family that lost it in 1999, on the morning of the raid. "Family first," reads the tattoo he recently inked on the inside of his biceps. "That's all I'm playing for," he says. His mother is scheduled for early release in the summer of 2017, and lately he has begun calling his father to make plans. "Maybe get her a condo," his father said during one of their conversations. "I'm thinking bigger," Thomas said. "A house?" his father said. "Bigger," Thomas said, and then he unveiled his vision. He would earn the huge contract and buy a plot of land just outside Atlanta, where they could build one house or maybe even two. A family compound, he called it, explaining that he planned to get everyone back together. His mom would move in, and his dad too, since Thomas' parents had been talking again lately over the phone. They both wanted to live around Atlanta. "I'm not married, so it's not like it's something I can't do," said his father, who is still in the military. Then Thomas explained that his youngest sister would move in after graduating from college; and his other sister, a prison guard in Georgia, would come with her children; and Thomas himself would live there during the offseason; and grandparents and cousins would all be free to come and go. He wanted a place out in the country, with a long gravel driveway and a big field out back where the children could run -- a place not so different from the acreage of his childhood. "What do you think?" Thomas asked. "It sounds a little bit like the plot for a sitcom," his father said, reviewing the plan: a convict, a prison guard, an estranged couple and a professional athlete living together in the same house. But Thomas said he was serious. "This is no joke," he said. This was what he considered his familial duty. This was a plan for reconciliation, as conceived by an oldest son who in some ways was still recovering from what happened when he was 11 years old. His mother was about to get out of prison, and she was going to need them. "I'm making it my responsibility to give her a soft place to land," he said. Join the conversation about "The Long Way Home."